I shot these photos back in April when we were visiting friends in eastern Pennsylvania. I spotted this old, worn out, dilapidated chair in the back corner of their yard and thought it would make an interesting photo. I never did anything with the photos however, until now. The theme seems to fit, though. Enjoy. P.S. Submitted my last paper yesterday afternoon. I have a LOT of blogs to catch up on but I’ll try to get to everyone over the next few weeks before the next quarter begins. I missed seeing y’all and look forward to seeing what you posted while I was gone.. Previous Busy times . . . Welcome back…you were thoroughly missed and needless to say, you are back with a bang!! Why thank you, Kamakshi! It is good to be back. I have a LOT of reading to do to catch up with everyone but I look forward to it. As usual, I appreciate your stopping by and pausing long enough to leave a comment. Have a wonderful day. Welcome back, Cecelia … so good to see you again! Take it easy with the catching-up … there’s no rush. Loved the picture … that’s really “worn”! It is good to be back, and great to see you here. Thanks for stopping by. Have a great day. Thanks! I don’t know how long that chair has been sitting out in the yard, but it made for some nice photography! Thanks for stopping by. Have a great day. Congrats on submitting your last paper! Lovely take on the theme! Thank you very much! Now I can get back to a “normal” life! Thanks for stopping by, Uta. Glad you enjoyed the pics. 🙂 Have a glorious day! Thanks Doris. I missed y’all! Have a wonderful day. Welcome back, Cecelia. I agree with what Pseu and nrhatch, among others, have said. You are so others-oriented. I hope your family has a Happy Father’s Day. Thank you Barbara! You are so sweet. Glad to be back and seeing my old “friends!” Have a great day. Welcome back! Congratulations on submitting your last paper. Lovely combination of complimentary colors in your photos. And, a wonderful interpretation of the theme – worn. It’s a good thing you took photos of the chair when you did. That chair looks like it’s just about worn out! LOL–Yes, I rather doubt the chair will survive til my next visit to that part of the country. Glad you liked it! 🙂 Have a great day. good to have you back cecelia! nice chair, lovely colours. Yes! Quite interesting how something we view as worthless, worn, ready for the dump heap, can look so beautiful set amidst the flowers in a forgotten corner of the yard. Thanks for stopping in and for leaving a comment. Have a glorious day! 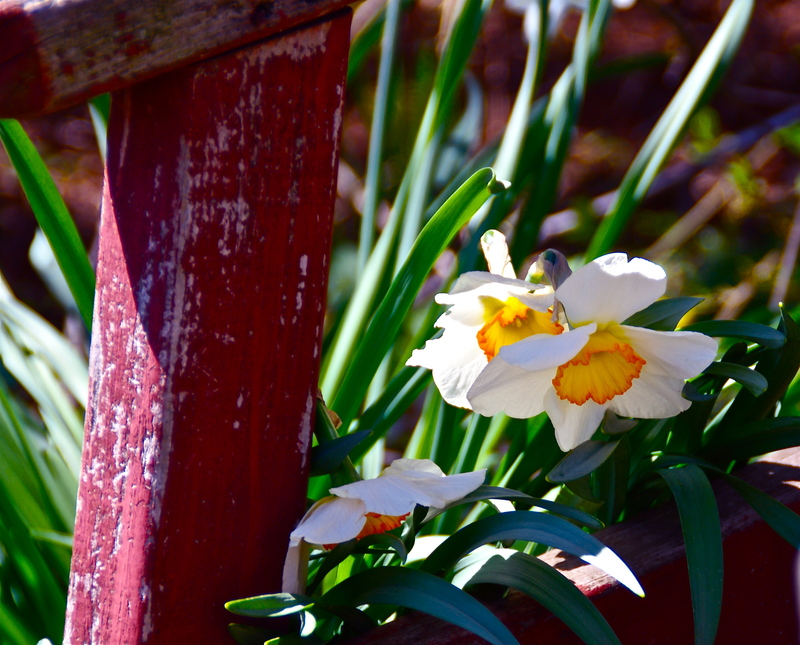 While it’s fading that splash of red still packs a visual punch… very cool, Cecelia! Thank you SIG. 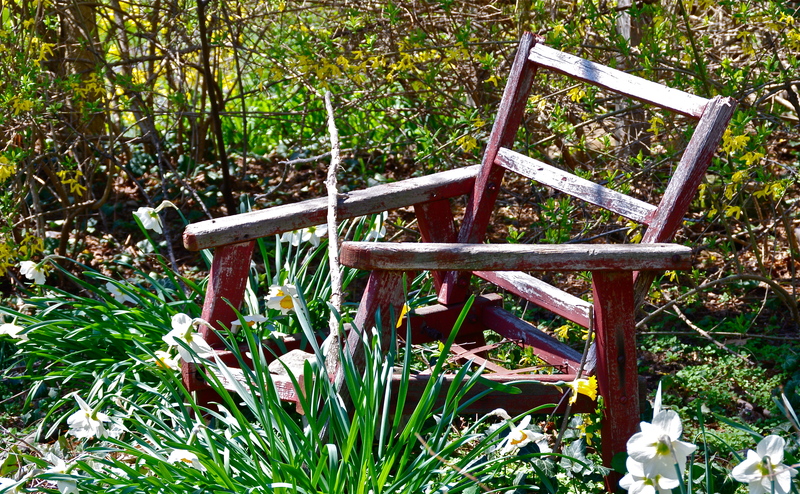 As strange as it sounds, I love that weathered chair…something very artsy. Glad you like it. Welcome back Cecelia! Love this picture as well! The flowers look lovely as well! Thank you. It was a pretty cool discovery for me, and very photogenic. I think I’m going to play with it more…maybe try B&W with a splash of red. If it works, I’ll post it. If not. . .
Like the chair. Jig saw puzzle material I think. Looks like it has outlived its occupant. Cool idea! I never thought of a jigsaw puzzle, but yes, I would have to agree with you. Thanks for stopping by and pausing long enough to leave a comment. Much appreciated.